This Oahu helicopter tour puts North Shore front and center. It introduces you to Kahana Bay, Sunset Beach, the Banzai Pipeline and crashing waves that reach heights taller than four-story buildings! Surfers from around the world congregate to North Shore for its perfect waves and stunning sandy beaches. The refreshing destination is a thrill to behold from the coastline, so just imagine how incredible the turquoise waters look from way up in the sky. This Oahu helicopter tour puts North Shore front and center. It introduces you to Kahana Bay, Sunset Beach, the Banzai Pipeline and crashing waves that reach heights taller than four-story buildings! 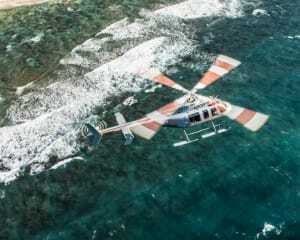 Hop into your MD500 helicopter and take off from Turtle Bay Resort. Travel along the North Shore to Banzai Pipeline, a reef break that serves up delicious swells! Swoop over Sunset Beach, which plays host to the Vans Triple Crown of Surfing. Get aerial views of Shark’s Cove, one of the world’s top scuba and snorkeling destinations. See Waima Bay and the Ko’olau Mountains! Head on over to Kaliuwa’a (a.k.a. Sacred Falls) for the spectacular cascading scenery (these particular sites are only accessible by air)! The entire trip wraps in 20 minutes, making it the perfect helicopter flight for those who want to squeeze in some added adventure on an already bustling vacation! i appreciated the knowledge our pilot had of the area we flew over and the information he provided during the flight. I felt I could ask questions. The communication during the flight worked well.